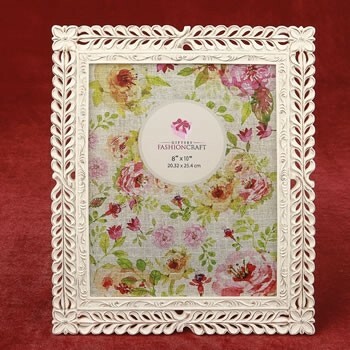 Our elegant ivory frames with a rose gold lattice make the perfect display for vintage-style portraits of children. Create one-of-a-kind keepsakes for grandparents to treasure! 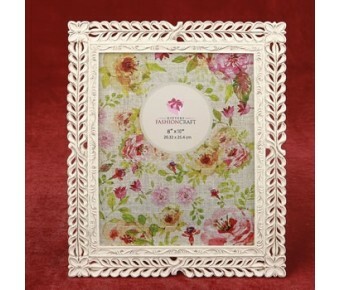 The frame is crafted from poly resin and features a exquisitely detailed lattice work design. Each frame is hand painted in an ivory color and finished with a rose gold rub. The frame holds a standard 8 x 10 photo and has a velvet easel backing that allows it to stand either vertically or horizontally. These frames will add a touch of class to your shelves. Attract new customers looking for something unique and special to offer as a gift.